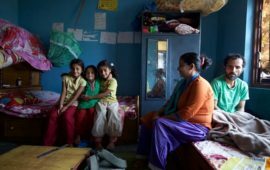 On April 25, 2015, this family of four had their lives turned upside-down by the deadly earthquake that devastated Nepal. One year later, almost to the day, their lives were disrupted once again — but this time, it wasn’t an earthquake that struck. It was typhoid. Like parents all over the world, Ram Kumar and his wife, Junu Maya, will do anything to keep their children from harm. After they survived the 7.6-magnitude earthquake, they took out a loan to build their family a new house – this one sturdy enough to withstand earthquakes. Within the four walls of this house they tried to create a safe environment for their children, Ayush and Ayusha. Ayush, Ayusha and Ram in front of their family home. 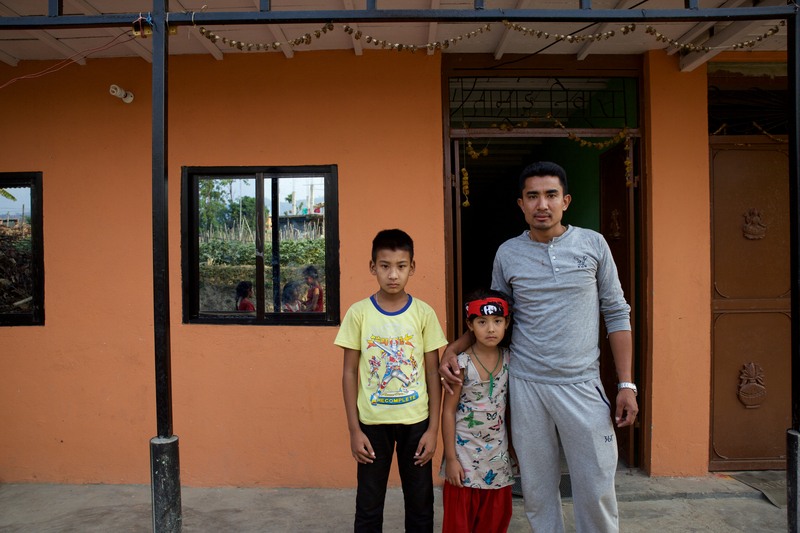 After the devastating 2015 earthquake in Nepal, the Lama family rebuilt their home from wood and stone, taking out a loan to ensure their children were safe from future earthquakes. But not even the most dedicated parents can shield their children from all dangers. Although Ram and Junu always made sure their children washed their hands and that the food they ate was safe from contamination, they could not control the world outside their home. 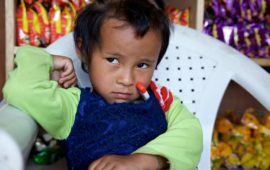 Typhoid is endemic in Nepal, meaning the bacteria that causes the dangerous disease could be present in any cup of untreated water or on any street vendors’ hands. A safe and effective typhoid conjugate vaccine that can protect adults and young children against typhoid is licensed in Nepal, but it is currently not routinely used. The Lama family, like many of their neighbors, had not received the vaccine. They were living in a typhoid-endemic neighborhood without the single best protection against typhoid. Eleven-year-old Ayush was the first to get sick. Chills, cough and a high fever kept him home from school for four days, while Ram and Junu watched over him and hoped that his fever would come down on its own. On April 28, they brought Ayush to Dhulikhel Hospital, where staff recorded a low white blood cell count, a fever of 102 degrees Fahrenheit and a positive blood culture test for typhoid fever. Ayush was lucky. He had no complications with his medication and was soon able to return to his classes. Everything seemed well for a while — but just as Ram and Junu thought they could relax, their daughter Ayusha fell ill.
Ayusha sits in the kitchen with her mother, Janu. Like many suspected typhoid cases, Ayusha was never brought to the hospital and did not receive medical care. One of the strongest risk factors for typhoid is having a member of the same household sick with the disease. Ayusha’s fever, although it lasted for three sleepless days, was less severe than her brother’s. Perhaps for that reason, or perhaps out of a desire to avoid the heavy economic costs of a hospital visit, Ram and Junu didn’t bring her to the hospital, so it was never confirmed whether or not she had typhoid. That isn’t unusual: many cases of typhoid go undiagnosed. An estimated 60 to 90 percent of patients with typhoid fever do not receive medical care or are treated as outpatients. This chain of transmission is exactly what the typhoid vaccine is intended to prevent. 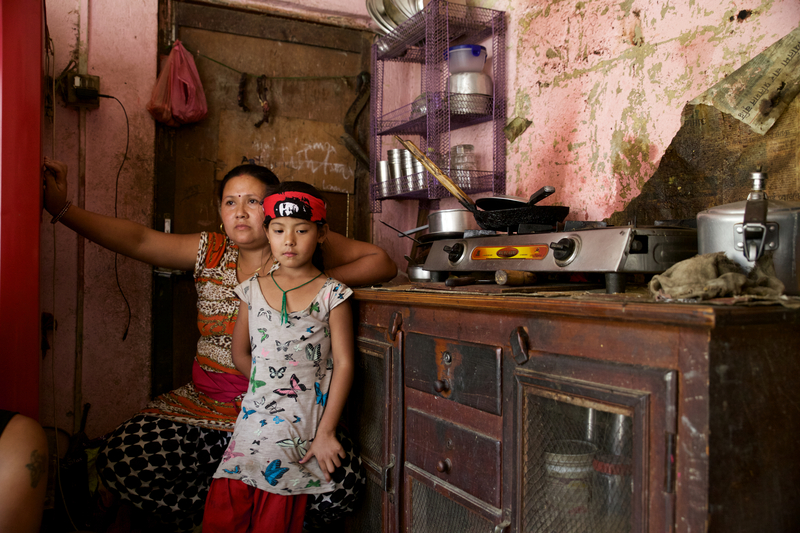 Ram and Janu took steps to limit their children’s exposure to contaminated food and water, but their precautions were not enough to keep typhoid out of their home. Handwashing and drinking safe water at home are vital, but not enough by themselves. Expanding coverage of typhoid vaccines through routine immunization can prevent the spread of disease and save lives. It could have also saved Ram and Junu a lot of worry, financial expenses, and sleepless nights. Reporting and photos by Mithila Jariwala. This post is part of Stories of Typhoid, a series sharing the impact of typhoid on families in endemic countries.